Description: Level: Undergraduate / graduate engineering, concurrent / simultaneous engineering, PLM (Product Lifecycle Management), CIM (Computer Integrated Manufacturing), lean design, IT, product/ process/ service design engineering, 3D printing, rapid prototyping, additive manufacturing, manufacturing systems and industrial engineering and management. Several sections and cases could be ideal for even for high school students and technicians learning/ exploring product/process/service design. Industrial Sponsors/ Contributors include with special thanks to IBM / Dassault Systemes, Delmia, BMW (UK and USA), Bentley, BMW, Boeing, Cadillac, DaimlerChrysler, Ford, Ferrari, GM, Honda, Jaguar, Mercedes, Mitsubishi, Nissan, Okuma, Renishaw, PTC, Mori-Seiki, Rolls-Royce, Toyota, Volvo Motor Cars, Yamazaki, CIMware Ltd. UK, CIMware USA, Inc., and others. Contents: 1. 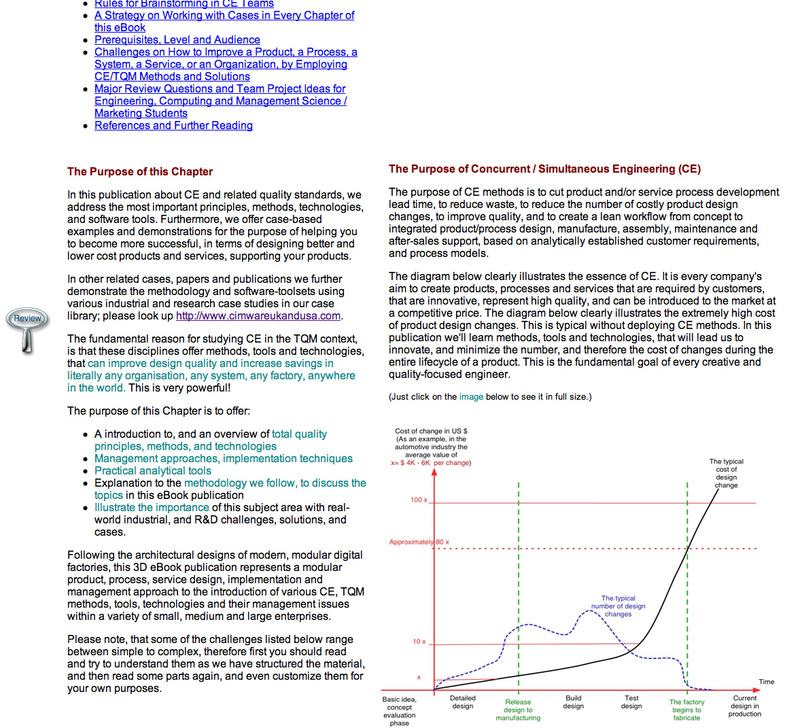 An Introduction and Overview... within an Integrated Engineering Design (CE) Framework; 2. 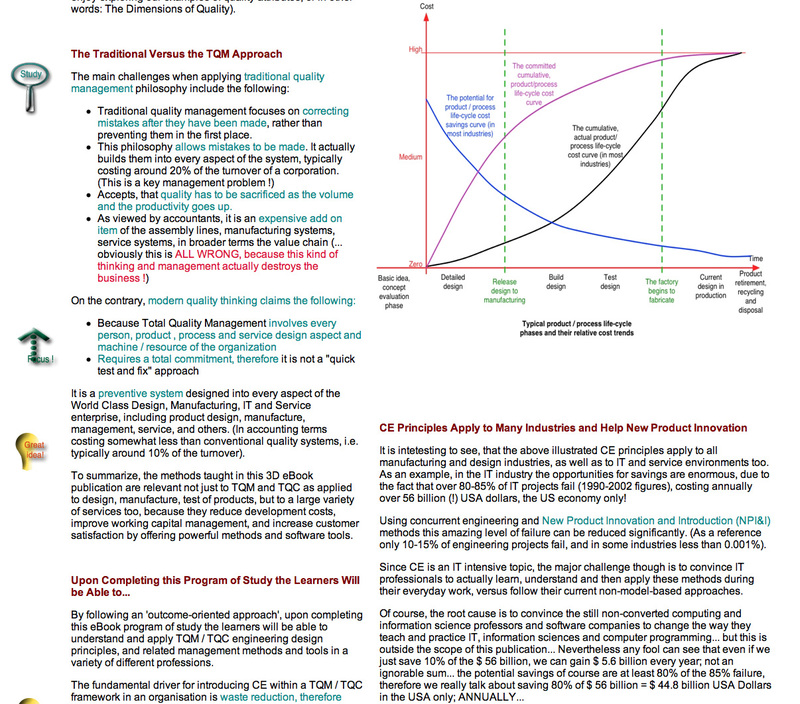 An Overview of International (ISO 9001:2008, ISO 9001:2015) and US Quality Standards, and the way these Standards Should be Applied in Concurrent / Simultaneous Engineering and PLM; 3. Design For Manufacturing, Assembly, Quality, and for Other Objective Functions (DFx); 4. Computer Aided Design and Manufacture (CAD/CAM) and Concurrent Engineering Methods and Tools; 5. 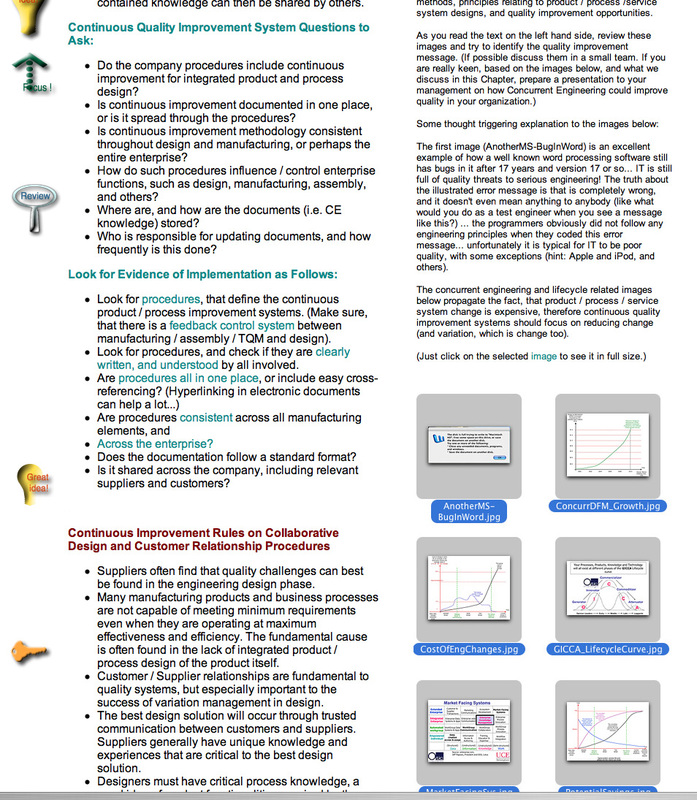 Concurrent Engineering Information System and Process Modeling 6.Concurrent Engineering, Advanced Integrated Product / Process Design Methods, as Part of Collaborative Design in PLM; 7. Integration of Concurrent Engineering and Quality... Collaborative, Networked TQM; 3D Printing and Rapid Prototyping 8. 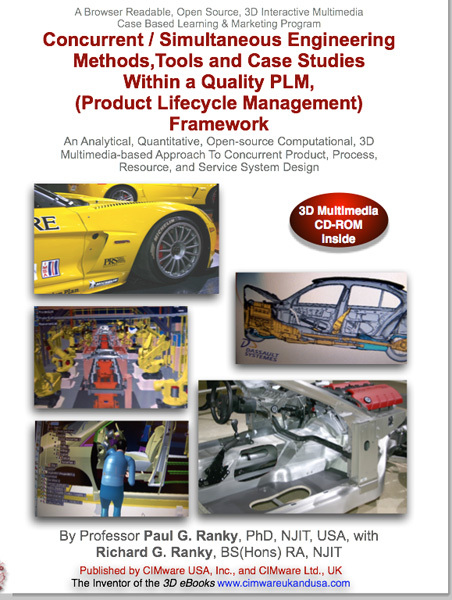 Concurrent Engineering Customer Requirements Analysis Modeling, Based on the QFD (Quality Function Deployment) Method, Using Our CORA (Component Oriented Requirements Analysis) Software Tool for PLM; 9. Concurrent Engineering Process Failure Risk Analysis Modeling (PFRA); a Failure Mode and Effect Analysis (FMEA) Method, and Our Software Tool; 10. Case Study: Collaboration of Parametric Technology's ProEngineer Wildfire and Windchill Software Tools 11. 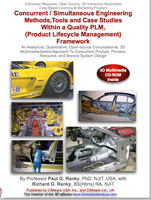 Rapid Prototyping Methods, Tools 12: Kaizen, Kanban, JIT (Just-in-Time), and Lean Production Control Methods to Support the Integrated Design Processes and Flexible / Real-time Dynamic Supply Chains in PLM 13. The Lean Six Sigma Methodology 14. Networked CE and Green Sustainable PLM Methods, Tools and Technologies, on a Global Basis; 15. CAD, CAM, and Other Software Quality Improvement Issues and Solutions; 16. Integrated Engineering and TQM Methods... Cases in Service Industries; 17. Quality Design Teamwork 18. Some Aspects of Globalization and Outsourcing in PLM 19. Continuous Design Improvement Methods Glossary of terms. Active Code, and Customizable MS-Excel Templates. (Note, that you'll need MS-Excel, or a compatible program in your computer to run our code). Authors: Paul G. Ranky, PhD, Registered Chartered Professional Engineer, Full Tenured Professor, Department of Mechanical and Industrial Engineering, NJIT, New Jersey, USA. IEEE Green Engineering Editor. He is an international expert in integrated product, process and service system design, lean/flexible manufacturing, total quality management, and 3D interactive multimedia. He has published over 300 works in the above fields. Richard G. Ranky, BS(Hons), NJIT, USA, Mechanical Engineering, MS, and PhD (Mechatronics, Northeastern University, Boston, USA). He is developing and researching 3D printing and Medical Device Design Engineering methods and tools. System Requirements: DVD-ROM: Multimedia Mac, PC or Linux. Use a 800 MHz CPU or faster, and 16 bit, 800 x 600 dpi, or better screen resolution. Runs off-line and/ or on-line the web using a web-browser and QuickTime ver. 6 or later available FREE from: http://www.apple.com/quicktime/download. Sample 3D eBook screen-print, another screen print, and one more...PLease note, that these are only static screen prints, the real screens are all interactive.